WWE superstar John Cena is the recipient of this year’s Sports Illustrated Muhammad Ali Legacy Award. The award, which was announced Thursday, is given each year to an athlete or sports figure who embodies the ideals of sportsmanship, leadership and philanthropy while using sports as a platform. “It really is a wonderful match. I never try to downplay that experience because a family has been given one wish and that is to meet you or hang out for an afternoon,” Cena said. Cena has been involved with the foundation since early in his career with WWE. He has also been an advocate for breast cancer awareness and WWE’s relationship with the Susan G. Komen Foundation. Cena’s younger brother is a survivor of Stage 4 brain cancer due to early detection. He went to WWE in 2012 after seeing what other sports were doing to raise awareness. “I saw baseball doing the pink bats, football with the pink cleats and I asked why we weren’t doing anything. I pretty much established the connection and years later we have donated millions and helped a lot of people,” he said. Lonnie Ali, Muhammad Ali’s widow, and Sports Illustrated’s editorial staff help select the honorees each year. 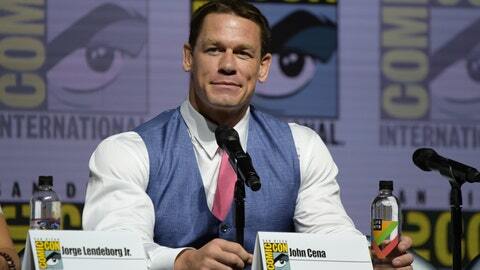 Cena also sees receiving the award as another important milestone for WWE. He is starring in the film “Bumblebee,” which opens in late December, before returning to the wrestling ring later this month.